This useful 50.8mm (2 inch) to 31.7mm (1.25 inch) reducer has a tiny 1mm profile saving valuable back focus. 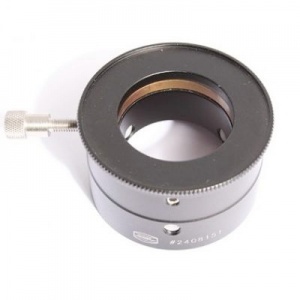 This makes it the ideal companion for the Steeltrack Newtonian and Refractor Crayford Focusers. The Baader Pushfix reducer has a number of unique and useful design features. It uses a brass compression ring to save marking eyepeice barrels and is threaded to accept 50.8mm filters. The clever use of recessed and nylon set-screws allows the permanent or semi-permanent fixing to 31.7mm eyepeices to convert them to 50.8mm size.